The sun is out, making it the perfect time for fun activities to help you get the most out of the season. Pick up a few friends for an afternoon excursion, invite the kids and grandkids over, or venture out on a longer trip to create a summer filled with memories. When you’re planning on being outside in the sun for a long period of time, it’s important to take safety precautions. Drink plenty of water to stay hydrated. This is especially valuable if you’ll be outside on hot days in the middle of the afternoon. You don’t need to overdo it, but add in one or two extra eight-ounce glasses. Use sunblock. A water-based or chemical-free sunscreen with an SPF of 30 or higher is ideal for optimal protection. If you’re concerned about an allergic reaction, choose a sunscreen that is PABA-free and uses titanium dioxide or zinc oxide. Use protective clothing. Sunglasses and wide-brimmed hats are two easy ways to protect your skin and eyes from sun damage. If you’ll be outside longer, consider a longer shirt or pants with built-in sun protection. Whether you pair up with another couple or invite your children and grandchildren to come along, there are some activities that are better done with a group. Gather your golf clubs for an afternoon on the greens. You can teach younger players the rules and techniques of the game, while enjoying watching them learn something new. If golf isn’t your sport, try mini-golf. These courses feature challenging additions which make the game exciting. Pack a picnic. People of all ages love the excitement and nostalgia of a picnic. Make sure to bring along summertime favorites, like a flying disk or a ball to play catch. Find a drive-in movie theater. While the number of screens has decreased throughout the years, there are still quite a few in existence around the country. Many show new releases as part of a double feature. Take a trip. 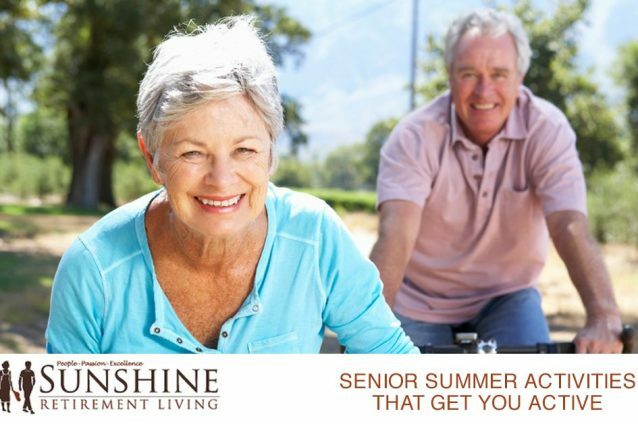 Sunshine Retirement Living Community has 16 different locations in eight states. You can stay for up to seven nights in a guest suite, and check out locations in Arkansas, California, Florida, Georgia, Louisiana, Oregon, and Texas. Put the top down on the convertible, hop on a train or jump in a plane, and enjoy the warm travel weather. If you’d rather stay around town, look into a stay-cation. These are typically one-day excursions where you explore your community as if you were a visitor. Check out sites you don’t normally frequent. Is there a president’s birthplace? A museum you’ve never seen? Pencil in a staycation on your calendar this summer. Hit a local pool or pack up for a beach trip. Whether you just want to dip your toes in, or are a serious swimmer looking to log some laps, the summer sun will warm up the water and make for a fantastic day of swimming. The weather isn’t quite frightful, but it might not be delightful all summer long, either. When you’ve got the rainy-day blues, take advantage of the opportunity. If it’s a light drizzle, get outside and bring back childhood memories of catching raindrops on your tongue or stomping in puddles. As it dries, relax and take in the sights of nature enjoying a fresh drink — you’ll see plants springing back to life and bolder colors than normal as flowers seem to bloom a bit brighter and grass returns to green. Too rainy to go outside? Invite friends over for an afternoon of cards. From Crazy Eights and Go Fish to Pinochle and Hearts, there are plenty of options to weather the storm. If you find you’re rusty on you card games, the instructions for most popular card games like Rummy are available on the Internet. Relive some of your favorite summer memories by pulling out pictures from your travels. Sort through some of the pictures from your trips around the country or overseas. You could spend your afternoon crafting with the pictures, to put together a scrapbook or collage. You’ll like the feeling of accomplishment by finishing the project, and will love being able to see your favorite pictures whenever you want. Putting together puzzles is another way to avoid any summertime storms. Some people choose to use an adhesive element that makes the puzzle permanent. This allows you to hang your puzzle as a piece of art, or use cut the completed poster into coasters. Others take leftover pieces to assemble beautiful, easy crafts. Thank you for reading this blog post, we hope you enjoyed it. To speak with one of our friendly and knowledgeable staff members, click here today. For more ideas on how to make the most out of your summer or to join us at any of our weekly community activities, contact a friendly and knowledgeable staff member today.